I am not a singer, but when it comes to Christmas songs I can’t help myself! As it gets closer to Christmas, the singing in my classroom begins to get a little loud. Inspired by the cheerful voices, I have a freebie for you! With a little movement, students get to vote on their favorite Christmas song by moving to one of four corners, share with classmates why a song is their favorite, and then graph the results. It’s sure to be a hit! 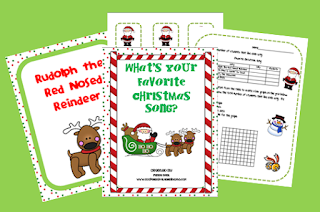 Click HERE to download this freebie from my TpT store. « You Are My Sunshine!